En 1991 el rock explota con la aparición de Nevermind de Nirvana. Lo que la industria intenta vender como el inicio de una nueva era es, en realidad, el final de una década de autogestión y bandas independientes que, abrazando la ética punk, conquistaron Norteamérica en los 80 y a toda una generación. This is the history of one of the many bands that will never appear in the rock chronology, but that are at the core of all the musical scenes. Groups that earn their respect from the public in small venues, touring by their own means and enjoying music in its essence. In 1991, rock explodes with the appearance of Nirvana’s Nevermind. What the industry tries to sell as the beginning of a new era is, in fact, the end of a decade of self-management and independent bands that, embracing the punk ethic, conquered North America and a whole generation in the 80s. 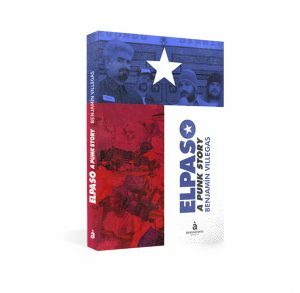 In 2015, Benjamín Villegas (Ripollet, 1982 ) – musician, illustrator, audiovisual producer and graphic designer – travels to El Paso, Texas, in search of the history of ELPASO. Follow the trail of a suitcase full of old flyers, fanzines, collages and a couple of recordings of a Chicano punk band that sang in Spanish and that could have changed the history of rock.